I have looked at osmoregulation in a previous post but in this final post for half term 2015, I will give a few details about thermoregulation. 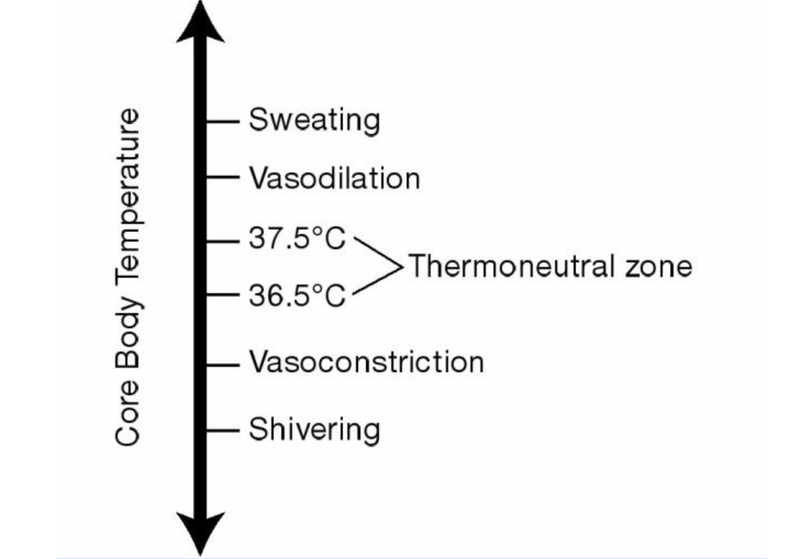 Thermoregulation means to maintain the core body temperature at a set value. This can be energetically very costly as the animal has to respire at a much higher rate to release the heat needed to warm the body, but it has allowed mammals and birds to colonise habitats that would be inaccessible to all poikilothermic (cold-blooded) animals. All metabolic reactions in the body are catalysed by enzymes. If the body temperature falls too low below the set value, the rate of an enzyme-controlled reaction will drop, and this would be a problem as metabolic reactions would happen too slowly. If the temperate goes much above the optimum temperature, then the enzymes that catalyse all the reactions in cells would denature. This means they will change their shape so that the “lock and key” mechanism of catalysis cannot work at all. In human thermoregulation, there are two sets of sensors that measure temperature. The skin contains hot and cold receptors which can respond if the skin gets too hot or cold respectively. The temperature of the blood is constantly measured by a second set of thermoreceptors which are found in the hypothalamus in the brain. 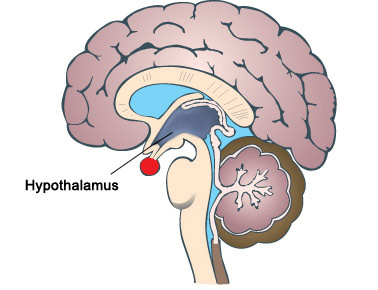 The hypothalamus also acts as the integrating centre, collecting information from a variety of sensors and then initiating an appropriate response. The main effector organ in thermoregulation is the skin. I have looked at the role of the skin in thermoregulation in an earlier post – click here to be taken to this…. Just check you understand the role of sweating, vasodilation in helping the body lose heat if it gets too hot and vasoconstriction and shivering if it gets to cold. I hope the earlier post will help! Please add comments/feedback/questions etc using the comment feature at the bottom of this post or tweet me @Paul_Gillam. Homeostasis is one of the more difficult topics for students to understand in the iGCSE specification. I have posted already about the skin and its role in thermoregulation so I suggest you read that post again to get the details…. In this post, I am going to try to explain the concept of homeostasis in much more general terms, then in later posts, look at the two examples mentioned in the syllabus. Here goes…. Homeostasis is one of the life characteristics shared by all organisms. Living things all inhabit a world in which the external environment changes from hour to hour, from day to day, from month to month. Even organisms living in the most stable aquatic environments may be subject to changing oxygen concentrations, changing water pH, changing light intensities and so on. This changing external environment poses a challenge for life since how can life processes operate at optimal levels in all these differing conditions. Life has solved this by allowing organisms to keep their internal environments much more constant than the ever-fluctuating external environment. This introduces the first area of common confusion in students’ exam answers. For some reason many students think that homeostasis is a word for the maintenance of body temperature in humans. I hope you can see it is a much more general term than that. But…. the systems that maintain a constant body temperature in endothermic animals are one example of homeostasis. In fact this example (thermoregulation) is one of the two from the list above that you need to understand for your exam. The other one you might be asked about is osmoregulation (the maintenance of a constant dilution of the blood). All homeostatic control systems have some common features. The variable that is going to be regulated needs to be measured somewhere in the body. A change in this variable is called a stimulus and is measured by a cell called a receptor. The measured value needs to be compared with a “set value” and this is done by an integrating centre that then controls an effector. 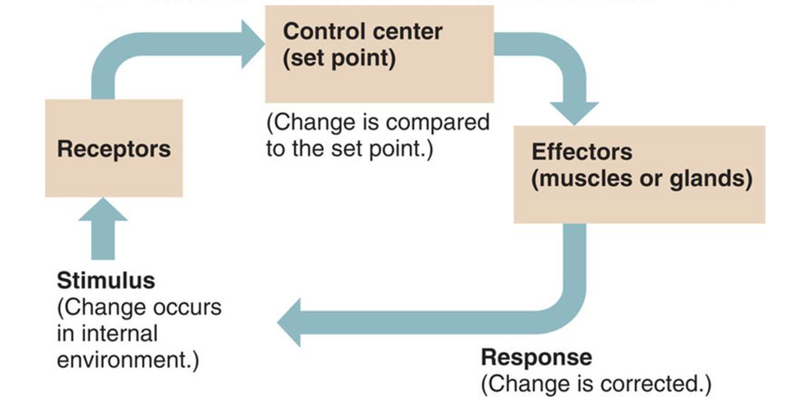 The effector is an organ that can bring about a response. But what kind of response do you want in the process of negative feedback? A common process involved in homeostasis is negative feedback. This is quite tricky to define but in fact it is a really simple idea……. If you want things to stay the same, any change must be corrected. That’s negative feedback in a nutshell. For example a school might want students walking round the campus at a sensible speed: not to fast to knock people over, not to slow or people are late for lessons… Imagine a particular group of children who start to run around the place, causing mayhem and injuries to fellow students. Well this will first be detected by the system. There may be a particular teacher who comes out and sees the students running, the school nurse might report an increase in cuts and bruises. However it happens, a change in the system (a stimulus) is detected. There will be an integrating centre in this control system too, probably in the form of a stern deputy head. She will compare the measured speed to her own “set value” of how fast students should move. And she will initiate a response: probably a loud telling off to the entire school in assembly, lots of dire warnings about future conduct and an after school detention for all the rule breakers. The net response of this will be that students will start moving slower around the school…. Eventually of course people will start moving too slowly and will be late for lessons. How do you think the system will react to this new stimulus? This process where the response tends to reduce the stimulus is called negative feedback. If the body temperature goes up, the system responds by lowering the body temperature. If the body temperature drops, the system responds by raising body temperature. Both examples of negative feedback! Any questions, problems, queries: please comment using the box below the post or tweet me @Paul_Gillam and I will do my best to help……. The skin as you all know is the largest organ in the human body. It has a variety of functions including providing a water-tight barrier to minimise evaporation from the cells; it is also a habitat for billions of bacteria that live on the skin, the so-called skin flora and it contains a variety of sensory receptors that provide information about the external world to our central nervous systems. The iGCSE specification requires you to know about the role of skin in thermoregulation. The skin is made up of an outer layer of dead cells called the epidermis that contains sensory nerve endings. Beneath this is the dermis which is made of living cells and blood vessels, sweat glands, hair follicles and other specialised sensory receptors, e.g. for touch. Underneath the dermis there is a subcutaneous tissue that in humans is packed full of adipose cells that store lipids. The skin is involved in thermoregulation both as a receptor and more significantly as an effector. The brain receives information about temperature from two sets of thermoreceptors. There are receptors in the hypothalamus that measure the temperature of the blood passing through the brain. This provides information about core body temperature. In the skin there are two types of thermoreceptors, called hot and cold receptors, that together monitor the external temperature. Information from both these sets of receptors is used by thermoregulatory centres in the hypothalamus to regulate your body temperature. The skin is the principle effector organ for thermoregulation. This is because it is found at the boundary between your cells and the external environment and so heat gain and heat loss happen through it. The skin has three ways of altering the heat gain/loss depending on nerve impulses from the CNS. Humans have sweat glands spread over almost all the surface of the skin. These glands secrete a watery liquid, sweat that contains a solution of salts and a tiny amount of urea dissolved in large volumes of water. Sweat is only produced when the body temperature is too high as the evaporation of sweat from the surface of the skin leads to a cooler skin. How does this process work? The main idea to understand is that the sweat itself is not in any way cool. Sweat is made in sweat glands from blood plasma so if the blood is getting too hot, the sweat will be hot as well. But it takes energy to evaporate water (to turn it from the liquid to the vapour state) and this energy (called the latent heat of vapourisation) is taken as heat energy from the skin. So as sweat evaporates, it uses thermal energy from the skin to turn the water molecules in sweat into a vapour. This evaporative cooling leaves the skin cooler once the sweat has evaporated than it was at the start. Hairs on the skin play an important role in thermoregulation in many mammals but not really in our species. If the body temperature drops, the CNS causes hair erector muscles to contract and pull the hair to a more vertical position in the follicle. If an animal’s hairs stand on end, a thicker layer of air is trapped between them and so the body is better insulated against heat loss. Humans are relatively hairless and the only thing that really happens in us when the hair erector muscles contract is that we get “goose bumps”. This is the main effector mechanism in human thermoregulation but it is also the one that tends to catch exam candidates out. Please make sure you understand this process fully and can explain this section of work very well indeed. If the body is getting too cold, the pattern of blood flow switches in the skin so less blood flows in the capillary beds near the surface of the skin and more blood is retained deeper in the skin structure. This is achieved by narrowing the arterioles that supply the capillary beds near the surface (arterioles and arteries have plenty of muscle in their walls that can contract to narrow the lumen of the blood vessel) This narrowing of arterioles is called vasoconstriction. The converse happens when the body is getting too warm. The muscle in the walls of these arterioles now relaxes to widen the lumen, thus allowing more blood to flow in capillary beds near the surface. 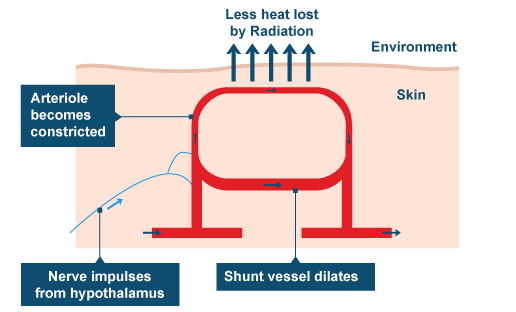 This vasodilation allows more heat to be lost from the blood by conduction, convection and radiation and so the blood leaving the skin has lost more heat to the external environment. 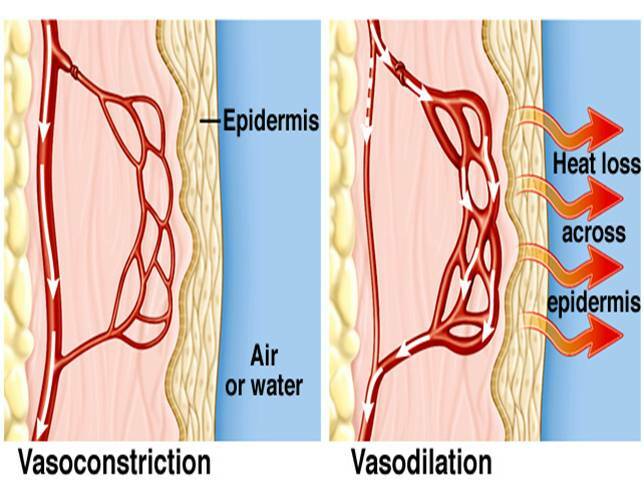 You will notice that at no point in these explanations of vasoconstriction and vasodilation do I mention capillaries in the skin moving deeper or nearer the surface. For some reason every year, GCSE candidates think that the reason you look redder when you are hot is because capillaries in the skin move nearer the surface. This cannot be true – blood vessels have a fixed position in the body for a start – but now you should understand that you look redder when you are hot because the capillaries that happen to be near the surface are having a greater volume of blood per minute flowing through them because of vasodilation. If you find yourself in the exam writing about capillaries moving in response to a change in temperature, please stop writing, take a deep breath, count to ten and then cross it all out and start again!